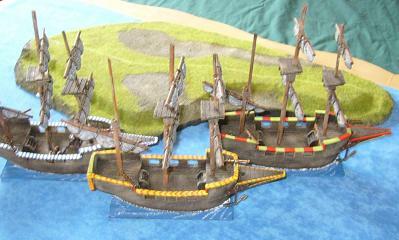 Grant and Philip played a 25mm DBR game using the Nicon armies, Buccaneers and Early Tudor English. The English cavalry threw themselves into the masses of Buccaneer infantry, but not many of them emerged again. A 9-1 win to the Poyrats. Two more games in the Ancients Competition concluded the first round. Firstly, Ivan got a decisive 25-0 win over Andrew. Ivan was using the Medieval Portuguese, in the Year of Great Regularity 1385. Andrew used Early Crusaders, with Bedouin and non-appearing Syrian Allies. A brilliant Crusader outflank arrived on the first turn, but didn't last long. In the other closely fought game, Al the Spartan won a 14-11 victory over Benny (Carthaginians in Spain). Just one Ancients Competition game at the club today. Philip (Mithridatics) beat Kendall (Normans) 23-2. The Normans had the wind in their favour, but going against them was an unreliable ally and a flank march that never showed up. NICON was held in Palmerston North this year, hosted by the Manawatu Duellists' Society, and held at the Massey University Events Centre. It was a spacious venue, and lots of large tables were available for the 25mm competitions. Catering was the basic wargamers' diet of pies and coke, and the fine convention tradition of free coffee and tea was maintained. Our club had players in most of the competitions: Nick in Warhammer; Benny in DBMM; Brett in Field of Glory; Lawrence, Philip, and Scott in DBR; Kit and Rob in Flames of War; and Al in Moderns. Robbie won the award for Best General in FoW, and Philip took second place in DBR. Pictures and results of DBR games are on our Renaissance page. There were two Ancients competitions this year, and the convention organisers considerately separated the tables of the DBMM fundamentalists from the FoG evangelicals. 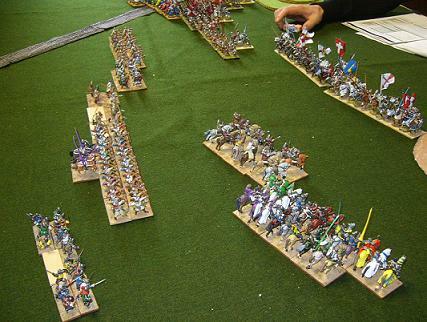 There were 14 players in the 15mm Field of Glory competition. Brett was our club's only player in this competitin. He used Later Carthaginians (Hannibal in Africa 202 BC). Benny also had Later Carthaginians in the 25mm DBMM competition which had just 6 players (3 from Auckland/North Shore and 3 from Wellington). Flames of War was a late-war competition with 1500 point armies. There were 30 players in this competition. 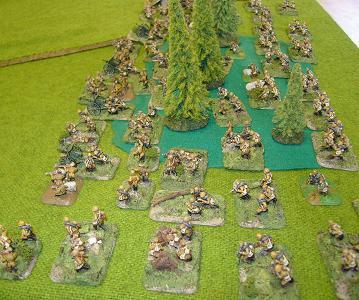 Pictured below is Kit's German force, and Rob's British Paras (on a snowy white terrain board). Rob won the award for Best General and was 4th overall, and Kit was 8th. 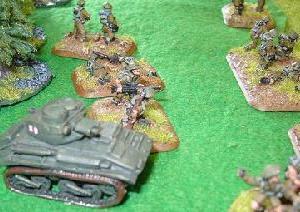 The Moderns 1/300 competition had pre-1980 armies. Al's army was the Black Watch and Royal Scots Dragoon Guards (Caribiniers and Greys). Lots of work had gone into making all the terrain, as you can see here. Nicon 2009 will be in Hawkes Bay. We had a few training games getting ready for the upcoming Nicon convention and FoW grand tournament. In a Field of Glory game, Brett's Carthaginians took on Andrew's Medieval Spanish. Rob's para force played Clinton's Germans in Flames of War. Grant's new Buccaneer army played John's Japanese in 25mm DBR. The buccaneer frigates are pictured here. The first game of the DBMM Ancients Competition saw an 18-7 win to Brett (Muslim Indians) over Lawrence (Later Assyrians). In a Napoleonics game, Rob (Duchy of Warsaw) played Andrew from City Guard with a Britishish Force. A draw after much trying to figure out how First Volley worked. Two Field of Glory games at the club today. In 15mm, Brett's Carthaginians took on Kendall's Wars of the Roses English. In 25mm Al's Spartans beat Rob's Medieval Portuguese. There was a Flames of War game between a small force of Finns holding the line against a rather larger Russian Guards formation. 13 April 2008. This was the club's Annual General Meeting. At the AGM we re-elected the same club committee. Fees are again set at $35 for the year. Two competitions for Ancients will be held using DBMM and Field of Glory rules. Competitions for DBR, Flames of War, and Warhammer might also be held this year, depending on how organised we get. 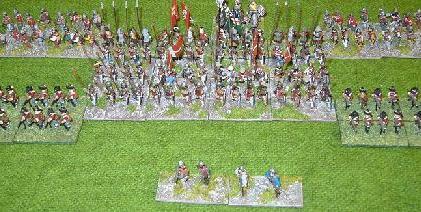 DBMM 25mm - Andrew (Early Crusaders) played Philip (Kushite Egyptians). 22-3 to the Egyptians. This was a 450AP game, in preparation for the AWC DBMM event 10/11 May. FoG 25mm - The game pictured here shows Rob's Medieval Portuguese (on the left) taking on Brett's Medieval Germans. We also had several visitors from the City Guard, playing games of Warhammer Fantasy Battle, and Warhammer 40K. 30 March 2008. 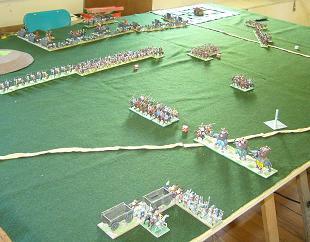 Today saw the first game of Field of Glory played at the club. Brett using Carthaginians under the inspirational leadership of Hannibal beat Philip using a Pontic army under an inspirational but anonymous general. In a Flames of War game, Lee's Finnish infantry won 4-3 against Kendall's US Armor. Next meeting, 13 April, is the Annual General Meeting. Natcon was held in Christchurch this year. Not many Aucklanders attended this year, and only two from our club - Kit and Rob both playing in Flames of War. Kit was third in Early War with Colonial Italians and Rob was 5th in Mid War with Brit Paras. Next year Natcon will be in Hamilton, so there should be a much bigger North Shore contingent then. Only two games at the club today, both 25mm DBMM. No FoG related activies at the club yet, other than lots of discussions and pawing of the new books. 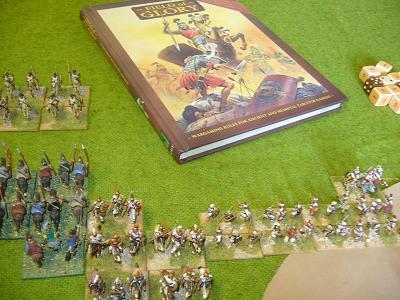 The game pictured here was 450 AP, played by Al's Spartans and Philip's Egyptians. 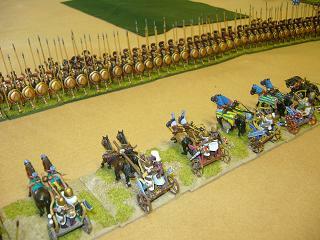 One Spartan flank command of Thracians and Peltasts was beaten by a combination of Egyptian cavalry and archers. 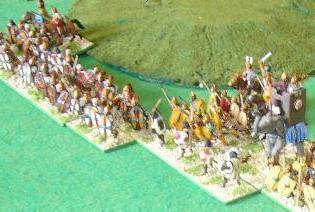 The Spartiates and mercenary hoplites were attacked by much greater numbers of Egypian infantry and chariots. The Greeks broke the attackers for little loss. The result was an 18-7 win to the Greeks. In the other game, Brett's Medieval Germans took on Kendall's Hussites. Our next club meeting coincides with the Nationals, but as we have only a few members attending this year our regular club meeting will go ahead as normal. We had three games at the club today. In a 25mm DBMM game, Benny's Carthaginians beat Andrew's Early Crusaders. A Numidian flank march arrived promptly, and helped defeat the knights. Meanwhile on the other flank, a Spanish ambush took care of a great mass of crusading pilgrim hordes. In DBR (15mm, 500AP) Lee's Royalists with Irish allies fought to a mutual break with Philip's Low Countries Spanish. The Spanish had two full-sized tercios. One was defeated by flanking firepower, the other fought its way through the centre of the English infantry. 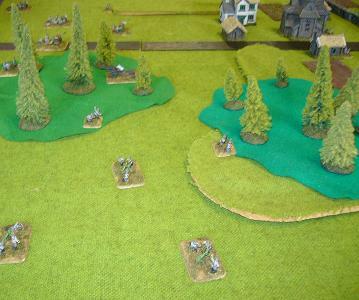 Robbie's NZers took on Kit's Germans in an early war Flames of War game. The Battlecry convention is on this week at the Freemans Bay Community Centre. We have three teams in the 25mm DBMM doubles competition: Brett and Lawrence (Medieval Germans with Swiss allies) came 4th with 52 points, Danny and John (Scandinavian Union with Swedish allies) 5th with 48 points, and Andrew and Philip (Kushite Egyptians) 6th with 42 points. Kit is taking part in a large multi-player Flames of War game on his desert terrain, and Robbie is playing the new Victory at Sea naval game. Also on at BattleCry are lots of Warhammer 40K games, and a there was a 1/300 moderns game based on an attack/defence scenario in 1980s West Germany. DBR 15mm - Lawrence (TYW German Catholics) v Philip (Knights of St John). The Germans' skirmishers neutralised the mounted knights on the flanks while the German infantry and artillery defeated the Knights' foot attack. Meanwhile the galleys of the Knights struggled against a headwind, arriving only in time to see their army break. A 10-0 win to Lawrence. Flames of War - Lee (Finns) v Kendall (US Airborne). An American victory. Flames of War - Lee (Finns) v Rob (British armour). Sustained assaults by masses of Shermans and Stuarts eventually took an objective. 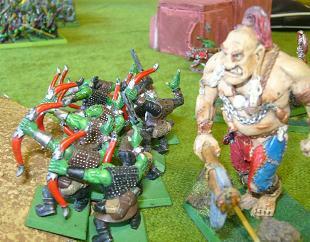 WHFB - Aaron brought out an old army of rats to take on Mark's Orcs. In a 25mm DBMM game, Benny's Carthaginians took on Kendall's Hussites. 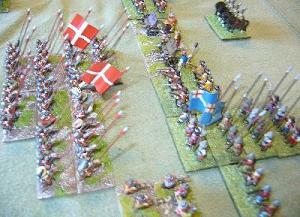 The Hussites had a flank march and a delayed command, both of which appeared on their first dice roll. The game illustrated here shows the Hussite army deployed at the top of the picture and their flank march just as it has arrived in the lower side. The Carthie infantry tried to break the main wagenburg but couldn't, the Spanish breaking. The nellies got one of the wagons in the outflank but the rest of the boys gamely held on for a 25-0 to the Hussites. Wine and biscuits all round!